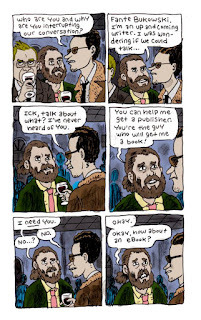 Fante Bukowski, by Noah Van Sciver. 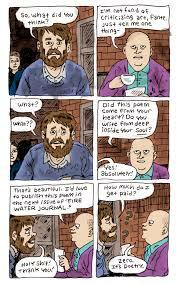 I've been reviewing Noah Van Sciver's work for six years, and I can't think of a single cartoonist who has improved more in the course of following their career. 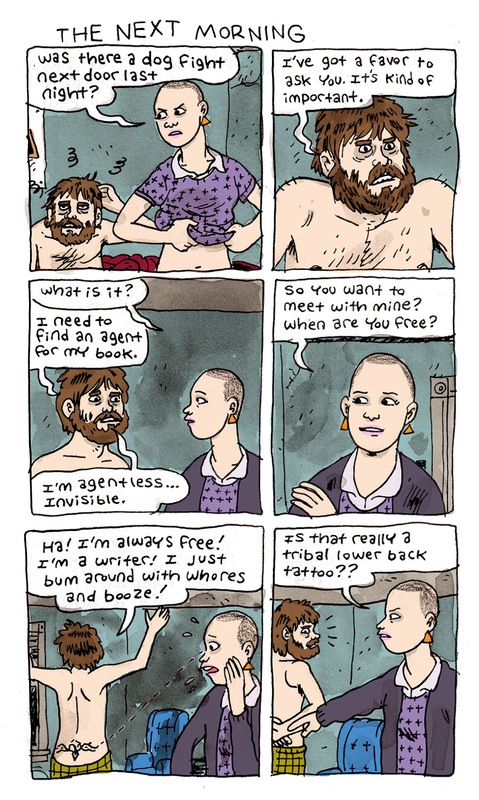 Through sheer hard work and a relentless urge to improve as both writer and draftsman, Van Sciver has become one of the best working cartoonists in the world. The themes and interests that have always driven his work, like crippling loneliness; the lives of outsiders, weirdos and grotesques; lives spinning out of control and a grim but frequently bitterly hilarious sense of fatalism continue to be featured. It's just that Van Sciver has matured as a writer, and he's now much more capable of creating fully-formed characters who are often living in absurd or nightmarish situations. Van Sciver is also a devastating satirist who uses himself as his best target, mining genuine laughs out of hubris, the stink of desperation, arrogance and self-delusion. Van Sciver is a restless creator, usually working on multiple planned projects at once as well as improvising projects in his sketchbook. 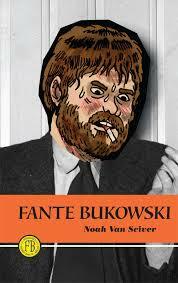 That's how one of his funniest projects, Fante Bukowski, came to be. Goofing around on the idea of a pretentious, privileged aspiring writer, he created Fante and started posting pages on the internet. While he played the idea of a guy so deluded that he would change his name to reflect his two favorite hipster authors for laughs, Van Sciver essentially paints him as everything he hates: someone who wants fame but isn't willing to work hard. Fante is a blowhard who takes on the trappings of the starving, bohemian writer, proclaiming his own genius even as he calls his mom up for money. One thing that I've always liked about Van Sciver's work is that he gives a lot of thought to every detail regarding his comics. He's especially interested in production design, and the design of this book is a pure, hilarious delight. It mimics the cover design, font, shape and paper type of a Bantam Books-style sleazy/literary novel from the 1940s. The entire package is a silent gag in and of itself, and that's part of Van Sciver's cleverness: using a visual gag without feeling the need to oversell it. Van Sciver's restraint and trust in his readers' ability to make connections is a big reason why he's able to inject both pathos and humor into his stories. 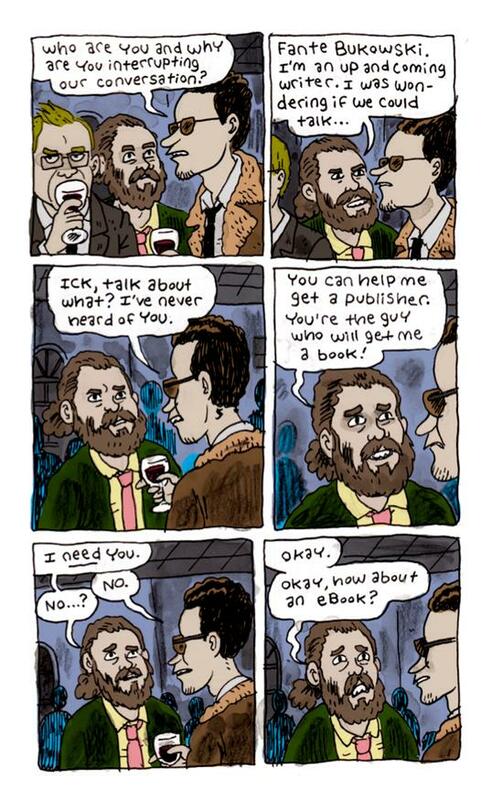 Even at his most satirical, Van Sciver still finds ways to make his characters at least somewhat sympathetic. Fante may be a buffoon and a hypocrite, but even in this story, there's a spark of humanity that's almost admirable. After all, he leaves his job work for his father as a lawyer to become a writer; it's just that the way he goes about trying to be an artist and his motives ("1. A big time book deal. 2. Apple stock. 3. Emma Stone") that are so laughable and sad. The book starts off with an episodic approach and stays as a series of vignettes, though Van Sciver quickly located the spine of his narrative as well as several key characters. There's a sleazy, starfucking literary agent, the publisher of a tiny but pretentious literary journal, an older guy at a bar that Fante befriends, and a young, slightly unhinged writer that Fante winds up sleeping with. One of the highlights of the book is a Dave Eggers signing that Fante attends, and he winds up insulting Fante while talking to the literary agent. Van Sciver portrays Eggers as kind of a sad sack: "Don't mind me...I'm not sitting right here. ...oh lord...I should have gone to computer college." Fante eventually gets some inspiration but winds up doing a bad rewriter of Milan Kundera's The Unbearable Lightness Of Being instead, earning him the wrath of the agent. The book ends with Fante leaving the city in an attempt to find himself in nature which ends as badly as one would expect. To round out this slender little volume, there are Fante pin-ups at the end (in the Mighty Marvel style!) that seem so fitting. Van Sciver is at a stage in his career where even a lark like this stands out as something that strikes a chord with both the artist and the audience. To be sure, this book is a ridiculous goof, with over-the-top characterization and some ridiculous situations. That said, Van Sciver took it upon himself to use the book to continue to work on his skills as a cartoonist and storyteller, and some of his best and most fluid character design can be found in this book. There's even a character who bears a resemblance to Archie Andrews and is as annoyingly square as one would expect a grown-up Archie to be. Still, the perpetually sunglasses-wearing, goateed literary agent is only slightly less interesting and funny than Fante himself. If Fante is a version of Van Sciver to some degree (perhaps a worst-case scenario), it makes sense that he would make the repulsive agent such an effectively mean character. Van Sciver has a way of making himself an object of derision in his books in a way that doesn't come across as whiny or self-pitying. He simply understands that when writing satire, punching down is frowned upon and punching up can be pretentious, but punching yourself is always funny.